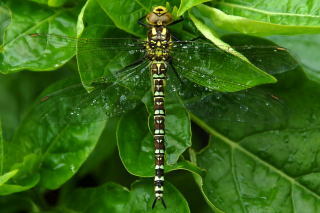 These days there is a lot of emphasis on creating a wildlife pond. As the world is gradually concreted over, naturally occurring ponds are disappearing rapidly. The burden of conservation has fallen on the shoulders of the gardener. 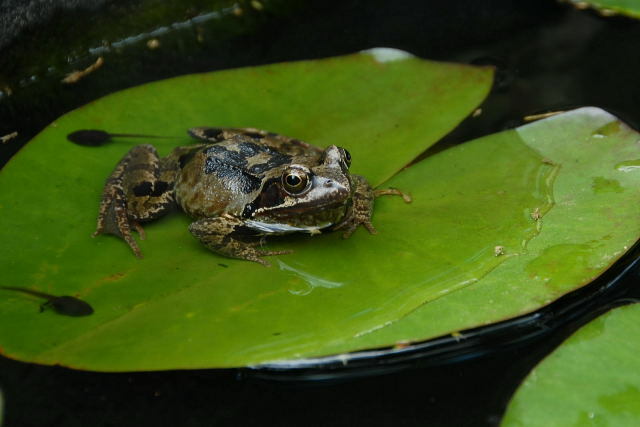 The benefit of a wildlife pond to the gardener (other than 'save the planet' brownie points) is in maintaining a healthy population of frogs. Frogs are reputed to be great allies in the war on slugs. It is also quite nice to see frogs hopping around the garden during the rain. The wildlife pond is also encouraged to provide the necessary habitat for a variety of other organisms. One of the nice things about such a pond is that it requires no effort on your behalf to stock it with creatures. They just seem to instinctively know it is there and turn up. In order for a wildlife pond to succeed however, it is important to create a fish free environment. Fish unfortunately enjoy eating almost everything that a wildlife pond is created for in the first place. Lots and lots of mosquitoes. Unfortunately this is where the argument against fish falls flat on its face. said to eat mosquito larvae. However, how many summers do you wish to go through, being eaten alive every evening, until such an equilibrium is reached? That is probably taking the whole tropical feel thing a bit too far. The trouble with equilibriums is they include a balance of everything. You do not want a balanced mosquito population. You want a zero mosquito population. Fish. Fish however,as stated earlier, will eat everything else as well. Small fish on the other hand can't. So you need to find fish big enough to eat mosquito larvae but unable to make much of a dent, if any, on the tadpole population. One answer is to use the stickleback Gasterosteus aculeatus, a native of most northerly countries in the northern hemisphere. Unfortunately they are not generally available in aquarium shops. They are however, quite plentiful in the British canal system. If though, you are uncomfortable fishing for sticklebacks in front of an audience of adolescent glue sniffers (or whatever passes for fun these days) there is another option. Occasionally there may be severe prolonged frosts. This could result in the loss of your white cloud mountain minnows. Maybe your fish had survived for several years, maybe for just one summer. The thing to consider, is what sort of quality of life had these fish experienced. Is it better to have led a full life, chasing insect larvae, falling in love and starting a family ? Or would life have been better,as is the destiny for most white cloud mountain minnows, ending up in a toxic aquarium, the size of a brick, in a child's bedroom? As the White cloud mountain minnow is a real fish, i.e. 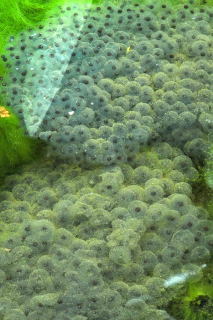 not genetically modified for the ornamental fish trade, chances are you will not see much of it in the pond. Nature has designed it so that it is hard to see from the surface. Having said that, it is now also available in orange. Best location for a wildlife pond. The ideal location for a wildlife pond will be some where close to vegetation. Frogs like to exit the pond directly into the flower beds. Locating the pond in the middle of the lawn or patio poses a problem for amphibians. They are forced to cross open country on their way to the safety of the flower beds. Watching a pair of Jays' playing tug of war with a frog is a gruesome sight. Frogs are also no match for the lawn mower. A wheel mounted rotary mower will make less of an impact on your frog population than either a hover or cylinder mower. Anything involving water and all that lives in it, benefits from being as large as possible. The more water there is, the more dilute any pollutants become. Frogs sometimes die in ponds, slugs fall in and drown, pigeons wash, leaves fall in and rot and so on. The smaller the body of water the more attention you will need to pay it. Smaller ponds will also dry up quicker. The depth of water is also important. Water has the unique property of being at its most dense at 4ºC. This fact allows the bottom of the pond to remain at 4ºC even when the top of the pond is frozen. To ensure a healthy margin of error, a depth of 18 inches or 1½ feet (if inches are meaningless), is recommended. The whole pond does not have to be this depth but a section of it should be. This is particularly important if you have fish. If your pond (wildlife or fish pond) does freeze, leave it alone. Do not think you need to break the surface. Nothing will suffocate. Most aquatic life goes more or less into a state of suspended animation in extremely cold water. They require very little of anything to survive at this point. They did after all, managed to get through the last few million winters without our help. Pumps and filters are best avoided in the wildlife pond. Frogs and newts do not appreciate moving water. Water quality is best maintained by aquatic plants. The fact that your wildlife pond does not contain any large fish means there is not all that much waste to contend with. Once a year though it is probably a good idea to have a good clean out. The chances are there will be a lot of rotting matter collecting at the bottom of the pond. The majority of this will be rotting vegetation from fallen leaves and aquatic plant die back. The best time to do this is in the depths of winter. You are least likely to disturb much activity. Frogs begin gathering in February so you need to clean out the pond before this. Remove everything from the pond. Plants can also be trimmed and tidied or divided at this stage. Next you need to remove all the sludge and leaves from the pond. A fish net with a sturdy handle is useful tool. Gently trawl the bottom of the pond collecting small amounts of muck. Be gentle, you may well catch any sticklebacks or minnows. Check the net each trawl for fish and rescue them. Keep them in a separate container to avoid recapture. It is suggested that the rest of the goo is piled by the side of the pond so that any other by-catch can crawl back into the pond. Once you have removed most of the muck, (You do not have to get out every last scrap of debris from the bottom), give the pond a partial water change of about 25% of its volume. Replace the plants and fish. After a couple of days the pile of debris left by the side of the pond can added to the compost heap or spread some where in the garden. During the summer, keep an eye on the water level. In a hot dry summer the pond will loose water through evaporation. Water is also lost through transpiration of any aquatic plants. Top up the pond with tap water but also administer a partial water change at the same time. Allow the pond to over flow for a while. If all you ever do is top up the water levels there is a gradual build up of salts within the pond. Plants and evaporation only remove pure water (Think of the dead sea).